Since 2009, this store has been so popular with the tween crowd that it has almost become a rite of passage for tween girls to own at least a few articles of their clothing. And now you can purchase a discounted Justice gift card, and get more fantastic clothing and accessories for less money! What’s not to love about comfortable, adorable clothing made from super soft materials? And with sizes ranging from 6 to 20, there is something for nearly any young lady between the ages of six and sixteen. Hard as it is to believe, you can actually shop for the clothes tweens love and still save money! With over 1,000 store locations across the United States and Canada, finding one close to you will surely be easy! So, why not buy your discounted Justice gift card today and save money on your entire purchase? All tween girls know that this is the go-to store for trendy comfortable clothes. And with mix & match coordinating pieces for every season hanging in her closet, she is sure to look fantastic every day of the year! Whether you’re shopping for school clothes or an outfit for a special event, you can find it in this store. Does your daughter have an upcoming recital? Perfect! Buy a discounted Justice gift card today, and you will save money on her outfit! Finally, you can shop in one of America’s most trendy tween store, without breaking your budget! And believe me, she will thank you! 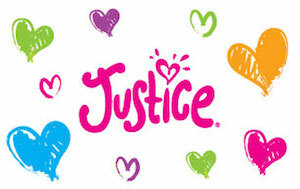 A Justice gift card is your answer to saving money on trendy tween clothing and accessories! And what’s more, Cards2Cash offers a variety of discounted gift cards for many other stores you may know and love. If you want to shop but don’t want to pay high prices, then be sure to check out our listings for Limited Too, Charming Charlie, Abercrombie & Fitch, American Eagle, and more! With Cards2Cash, saving money is easy as 1-2-3! If you own a Justice gift card but don’t think you will use it, then why not sell it to Cards2Cash? We buy gift cards to many retails! From pet shops to gas stations, we buy them! And what’s more, we pay top dollar for them! If you have a card you are interested in selling, just stop in one of our retail locations for cash payment on the spot, OR fill out our secure online form and we’ll get back to you with an offer for your unwanted card! Cards2Cash is your one-stop gift card shop!